When Ubisoft announced Far Cry New Dawn there was a moderate amount of excitement. Previous standalone spin-offs like Far Cry Primal and Far Cry 3 Blood Dragon swerved into wild high concept settings – Primal serving as a sort of prehistoric prequel and Blood Dragon a straight-to-video style sci fi adventure. New Dawn marks a series first by following up Far Cry 5’s controversial ending. But as Far Cry 5’s apocalyptic inheritor, New Dawn only delivers a shallow exploration of its premise and is more interested in the sheer anarchic fun of a fully refined playground of carnage. That’s fine actually, for as much as Far Cry 5 believed it was exploring big ideas like eschatological anxiety and the rise of militant patriotism, it had little to say. 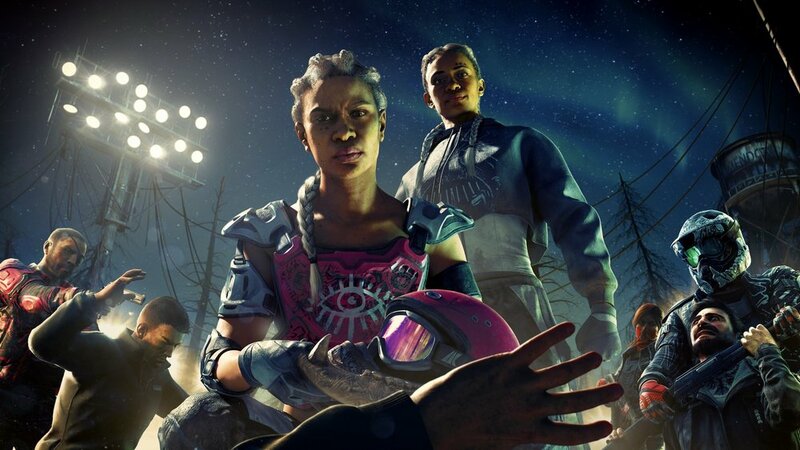 And while New Dawn continues to indulge in the franchise’s weirdest excesses – questionably over the top villains, weird shamanistic mumbo jumbo – it fine-tunes its formula for maximum fun. Far Cry is just as dumb as ever in New Dawn and its final act might even be the series at its most nonsensical – but it’s no longer pretending to be as thought provoking as its predecessor. Ultimately, that’s what makes New Dawn easier to enjoy. Your nameless and voiceless avatar in New Dawn is part of a group of rebuilders on their way to help the burgeoning community of Prosperity in Hope County who get waylaid by a gang of marauders known as The Highwaymen. The Highwaymen’s leaders, Mickey and Lou, say random Far Cry things like “are you a problem solver, or a problem maker?” and “power is the new currency” in menacing fashion, but it’s all nihilistic pseudo-Darwinist posturing that exists solely to explain their addiction to conquest, sabotage, theft and murder. After you establish contact with Prosperity, you’ll be tasked to blow stuff up all across post-nuclear Hope County in the name of acquiring resources, technical expertise and manpower. The focus as it always is, is on its violent playground. This time around that playground is essentially a reskinned Hope County. And as far as things go, New Dawn sustains the excellent systems of Far Cry with various tweaks to the formula that supply the novelty any franchise devotee craves. The result is a game that embodies the same maniacal intensity of its predecessors while leaning into its most celebrated absurdities, such as the wildlife that terrorize you and the emergent chaos of bandits and rangers squaring off against each other with rockets and flames. Gameplay-wise, New Dawn’s only downside is how much its open world avoids its own premise. See, Far Cry New Dawn is supposed to be set seventeen years after the collapse of federal authority in America mere moments after Far Cry 5’s Joseph Seed blows Montana up with a nuke. The world supposedly descended into chaos throughout Far Cry 5 and Hope County should have been flattened by nuclear devastation. 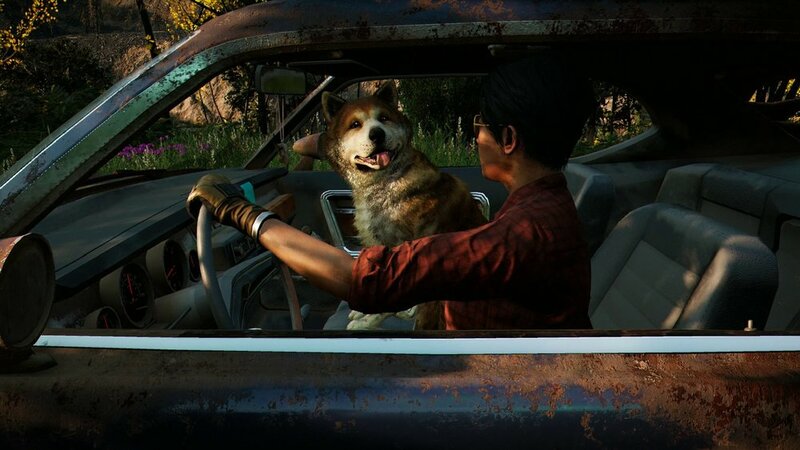 But instead it seems mostly unchanged – the map is smaller, explained by radiation-heavy zones you can’t enter – and despite the ramshackle buildings and post-nuke superbloom plays identically to previous Far Cry settings. 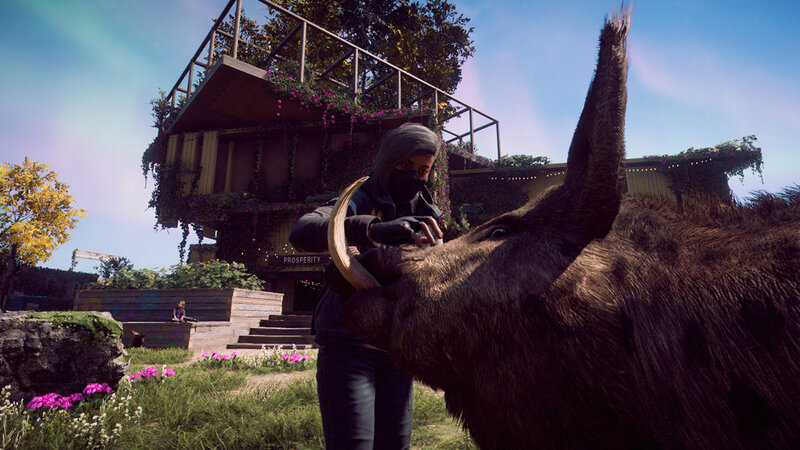 But pink flowers or no, Far Cry New Dawn is fun despite its familiarity. In fact, very often, that sense of familiarity gave exploration its own unique delight. So while it’s strange to have to uncover that fogged map all over again as if Hope County is uncharted territory, discovering a location I remembered from Far Cry 5 was kind of neat and cool. That sense of rediscovery rewards my appreciation for the virtual spaces of open worlds. New Dawn gives you a lot of freedom in matters of exploration and progression. At first, the introduction of tiered outposts and minions feels like it’s designed to limit you and cordon off your ability to progress through the story. But because you can hoard loads of resources and invest them wherever you see fit, it feels more like each tier has an entrance fee defined by your weapons and perks, as opposed to the experience level gates maintained by Assassin’s Creed Odyssey. Eventually you’ll feel pretty overpowered, not just because you’re decapitating people with projectile buzzsaws that ricochet off the walls, but thanks to various perks that ensure you’re some kind of ultra-powerful hybrid of MacGyver and Rambo. Cars will automatically repair themselves as you drive, enemy alarms can be set to explode, and a late game perk will even let you double jump, because, why not? None of these abilities keep you from being accosted by the usual shenanigans, but the shift is clearly from looking for trouble to finding the fun. The addition of maps located far from Hope County in the form of what’s called ‘Expeditions’ livens up the formula a bit. These missions task you with infiltrating hostile territories to make off with a package. A government plane wreck, a disused aircraft carrier, and a crashed space station comprise some of the diverse and interesting maps. Despite the overwhelming odds stacked against you, the mood is lightened by an easygoing and likable helicopter pilot named Roger Cadoret who flies you in and out. The treasure hunts remain satisfying despite their low challenge, and you’ll feel compelled to clear every outpost despite the lack of depth. You can even reset each outpost you’ve cleared so that it gets retaken by more advanced soldiers, and take it back all over again for better rewards. I know I delayed the resolution of the game’s main story several times just to take each outpost to their highest difficulty tier. In a nutshell, New Dawn’s gameplay never disappoints. Where New Dawn does disappoint is its continuation of Far Cry’s craven indifference towards story, character, and themes. It’s a problem that continues to haunt many of Ubisoft’s games – most notably those which fall under the Tom Clancy brand, like Ghost Recon: Wildlands and the recently launched The Division 2 – and it’s criminal that solid production values and fine-tuned gameplay systems continue to be undermined by shoddy writing. Far Cry New Dawn’s failure to develop ideas and themes can be glossed over – it never pretends to a level of thematic grandeur that Far Cry 5 claimed to reach for. But you can still hear the life get sucked out of the experience every time a cutscene begins. New Dawn works hard to establish that Mickey and Lou’s leadership of a band of murderous conquerors and pillagers is 'Capital E' evil, but does little to differentiate their exploits from your own. Sure, there’s never a point where you and your allies at Prosperity will slit someone’s throat for speaking out of turn or hand a live grenade to a child for self-amusement, but conquest, salvage and murder are all things you have in common with the Highwaymen. Despite that, New Dawn insists on framing you as the savior of Hope County and Prosperity, and it feels unconvincing. There are a few lines about justice and hope, but that’s about it as far as defining a moral high ground for you and your allies. This moral double standard becomes even more laughable when Joseph Seed returns to the story. Despite all his crimes – brainwashing, emotional abuse, psychological torture, nuclear genocide – he’s framed as a repentant figure who sees you as a pure soul. His arc is intended to be a twisted reach for redemption, but it comes off as ludicrous as the radioactive magic fruit he gives you that grants you superhuman abilities. Players are supposed to feel sorry for him, but instead I just felt sorry for the writers. But while Far Cry New Dawn is an inheritor of the studio’s reluctance to lock down solid characters and themes, it remains a beneficiary of Ubisoft’s rock solid development style and pipeline. So while it continues to disappoint by refusing to live up to its premises and squandering the potential of its characters, it remains an entertaining and delightful addition to the franchise. The hope is one day there’s a Far Cry with coherent plots and characters that don't invite ridicule, cause New Dawn it ain’t. The Cultists system is a devious and ingenious addition to the game that is perwoven into everything that Assassin’s Creed has always been about – murdering rich, powerful jerks. Our Assassin’s Creed Odyssey review is currently in progress. These are our first impressions. A combination of the latest version of Denuvo, version 4.8, a code mutator called VMProtect, and Uplay security has led to accusations that Assassin's Creed Origins runs worse than intended.